A tonneau cover is a common pickup truck accessory that’s used to secure items in the truck bed area. Truck owners choose to add tonneau covers for both functionality and appearance. There are many benefits of a retractable tonneau cover, such as increased protection against snow and rain for the items in your truck bed. An additional benefit of a tonneau cover is security against theft. Pickup truck drivers also install truck covers to enhance the appearance of their vehicle. Similar to truck racks and bed rails, tonneau covers are functional and also give a truck a more rugged, cool appearance. Tonneau covers come in a variety of types and are made from several different types of materials. Common tonneau cover types include roll-up covers, retractable and hard (fiberglass or aluminum) covers. Common materials used for tonneau covers are cloth, vinyl, aluminum, and fiberglass. 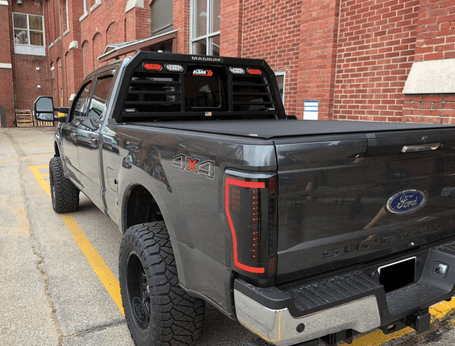 Let’s explore common tonneau cover types and the benefits of a retractable tonneau cover benefits, below. Price: Roll-up covers are the least expensive tonneau cover option. Installation: They’re easy to install and require no drilling or damage to your truck. Materials: Roll-up covers are made from soft materials, such as vinyl or cloth. Price: Retractable truck covers are generally more expensive than cloth covers and less expensive than hard tonneau covers. Installation: This cover requires a semi-permanent installation, where it’s mounted at the front of the truck bed as well as the sides. Materials: Retractable tonneau covers are more durable than roll-up versions. They’re usually made of vinyl or aluminum and are more secure and long-lasting than soft covers. Price: Hard covers are the most expensive of the tonneau cover options. Installation: Hard tonneaus require a more permanent install. Therefore, if you’re looking to avoid drilling into your truck, this is not a good option for you. Materials: A hard tonneau cover is made of aluminum or fiberglass. They can be locked which allows truck drivers to secure their cargo when they truck is unattended. Ultimately, there is not one best type of tonneau cover for all truck drivers. Each of the three types of truck covers has benefits and drawbacks for truck owners. When shopping for a cover, it’s important to consider your budget, and how you plan to use the cover most. 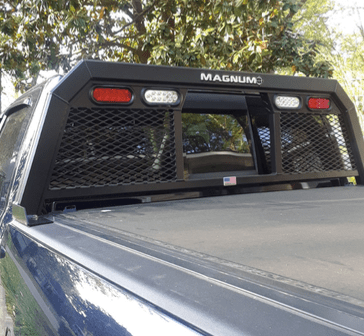 In general, tonneau covers are a great way to protect your truck bed as well as your cargo. Retractable tonneau covers are generally made of materials that interlock together in panels. If you’re looking for a durable, yet easy-to-maneuver truck cover option, a retractable cover is a great option. These types of covers allow pickup truck drivers to easily access the cargo in their truck bed without having to take the cover completely off. They are also less likely to rip or tear than a cloth cover. Finally, they’re easier to install than a semi-permanent hard tonneau cover. They’re tougher than cloth covers: Due to the fact they’re usually made of a semi-hard material, these covers provide better protection for your cargo than flimsy cloth covers. Better access to your cargo: The retractable truck cover is the only cover that lets you easily get to the items you need in your truck bed without having to unsnap the entire tonneau. Enhanced truck appearance: These covers give an added tough appearance to your truck without having to be permanently installed. They don’t tear or fade in the sun like soft tonneau covers and they don’t require you to drill into your truck like hard tonneaus do. Also, if you’re not sure how long you’re going to keep your truck, the retractable cover is the way to go because it’s not a permanent truck accessory. Will My Tonneau Cover Work with a Truck Rack? Your truck cover should be made of a durable material that can withstand weather conditions such as heavy rain, snow or sleet, depending on your location. It should also be easy for you to open and close, store and take off whenever you want. Choose a tonneau cover that offers a good warranty to ensure your investment is protected. Before purchasing a retractable tonneau cover, make sure it fits your pickup truck perfectly. If you’re unsure, ask the manufacturer of the truck cover about your specific truck make and model, regardless if you drive a Ford, Chevy, GMC, Dodge, or other type of truck. You don’t want any issues with the fit, installation process or removal process so it’s better to invest in a trusted name brand that you can rely on for good quality products. At the end of the day, your tonneau cover should enhance your truck’s appearance, not detract from it. A retractable tonneau cover will not only make your truck look more polished, but it will protect your truck bed as well. Be sure the materials used in your truck cover will be long-lasting and continue to look great over time. If you are looking for tonneau cover maintenance tips, we have you covered.